Traversing the foothills of the Himalayas and plummeting towards the mainland, Uttarakhand is home to some varied topography. Known as “The Land of the Gods” it is famed for its religious pilgrimage sights and attracts thousands of domestic and foreign visitors each year. 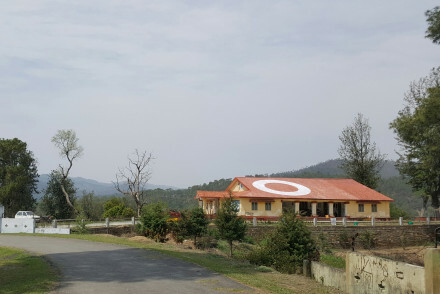 Our pick of the best places to stay in Uttarakhand are wide ranging and there is something for couples, families - in fact all holiday makers. From the jungles of Corbett National Park to the picturesque hill stations of Dehradun, Mussoorie and Nainital, explore the highs and lows of this diverse state. Whilst Hindu devotees head to Haridwar, foreign tourists flock to the yogic mecca of Rishikesh. For outdoor enthusiasts Almora is prime climbing country. Flocking to Uttarakhand for a bounty of reasons, Uttarakhand’s concentration of holy cities gives it an authentically spiritual feel, which many foreign tourists find both intoxicating and enlightening. Whether in Haridwar or Rishikesh, experience an evening aarti, a fire ritual on the banks of the river Ganges, honouring Lord Shiva. Uttarakhand also boasts some of the best spas and yoga schools in the world. Others go for the fresh air, great outdoors and mountain landscapes. On a clear day Almora has views across to the snow capped Himalayas and the Annapurnas, whilst Nainital and Mussourie are the perfect options for complete relaxation and tranquillity amongst the verdant hills. Uttarakhand's capital Dehradun is well known for its educational and governmental institutions that the British left behind and there are colonial buildings plus beautiful scenery to be enjoyed. Wildlife enthusiasts will love Corbett National Park, which received its title in memory of its namesake Jim Corbett, the famed hunter turned conservationist. Whilst you will be lucky to spot one of the ‘man eaters of Kumaon’ today, there are plenty of other animals to be seen from leopards to wild elephants, crocodiles and sloth bears. There are good train links throughout most of Uttarakhand in comparison to the rest of the country so, especially in the mountainous areas were road travel can feel like an endless slalom, it can be the best way to get around. Uttarakhand lies where the Himalayas begin. Enjoying a more temperate climate than the plains of India the hill stations in particular are an excellent option to visit in the summer months. Although the low-lying plains of Corbett National Park can reach the 40s. Explore the jungles of Corbett National Park and spot sloth-bears, crocodiles and elephants! Join a yoga session, at dawn, in Rishikesh. Go rock climbing in Almora! Experience a fire ritual on the banks of the River Ganges, in Haridwar. 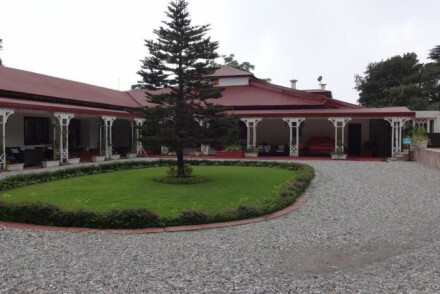 Walk amongst the old colonial-era buildings the British left behind in Dehradun! 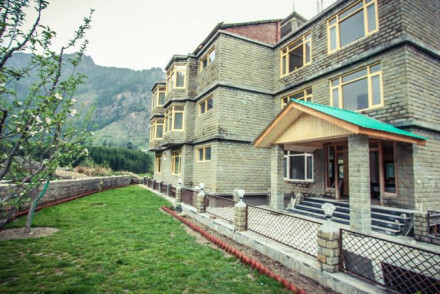 The Hotel Guru's selection of the best places to stay in Uttarakhand is wide ranging: from wildlife to spa breaks there are plenty of options to suit all tastes and budgets. A favourite amongst yogis around the world, Uttarakhand is home to some of the best spas in the country. 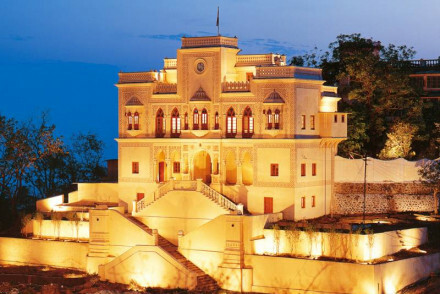 On the map since the turn of the millennium Ananda, housed in a former palace, has one of the most comprehensive Ayurvedic spa menus, plus daily yoga and Vedanta classes. Vana Malsi is an all-encompassing stay with tailor made detox treatments to suit your body and mind’s requirements, swaddled in the best of modern day luxuries. Then there is the modern Raga on the Ganges which boasts design accommodation and excellent spa treatments a tranquil setting as well as yoga and meditation. A wellness retreat tucked away in the Kumoani Hills, AyurVAID Kalmatia includes a resident Ayurvedic doctor, yoga and meditation practitioners, and personalised vegetarian menus. Add to this ten private cottages with mountain views and it is the perfect panacea for modern day life. 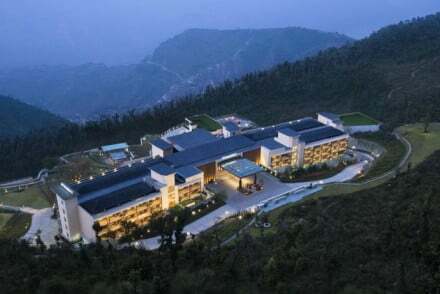 A modern resort built with the intention of providing ultimate indulgence and relaxation JW Marriott Mussoorie Walnut Grove Resort & Spa, has achieved its goal. Located along the banks of the Ganges, Aalia is a relaxing modern retreat with all the trimmings: wellness centre, spa, infinity pool, yoga and meditation. Infinity Corbett Wilderness for its superlative safaris including on foot, by jeep or elephant. Great for the enthusiast. Corbett River Creek Resort and Spa has something for everyone. 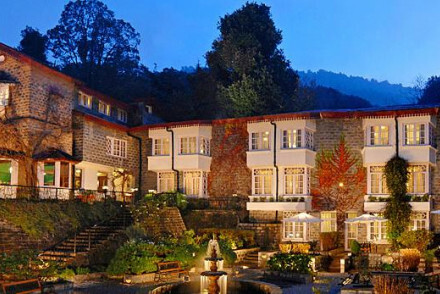 An indulgent stay amidst wildlife. With mountains and rivers and plenty of outdoor pursuits Uttarakhand has always been a favourite amongst families. Kids will love the tented accommodation at AquaForest Camp in Rishikesh. Well priced, located on the banks of the Ganges and with plenty of activities to keep the young ones happy. And with individual cottages and a four-bedroom villa, on site activities and bordering Corbett National Park: Aahana The Corbett Wilderness has everything a family would need. The dog and the kids are welcome at Corbett Riverside Resort – and well looked after. The large pool, fully stocked games room and outdoor activities take care of that. Due to the nature of activities (rock climbing, white water rafting) Atali Ganga might be better for those with slightly older children. But for those big enough to partake, this resort proves a wonderful family bonding experience. 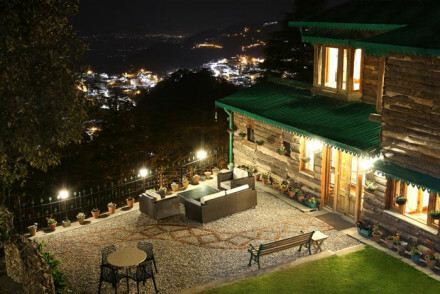 So many romantic retreats to choose from couples are spoilt for choice when it comes to finding the best places to stay in Uttarakhand for romance. Colonial bungalow turned boutique hotel, Te Aroha’s charming rooms, complete with four posters, are ideal for holidaying couples. 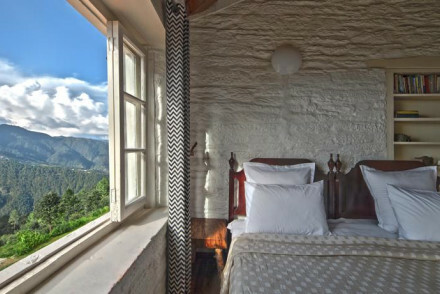 Wake up to views across the Nainital valley: Jilling Terraces’ whimsical décor and relaxing atmosphere mean it is the perfect romantic hideaway. Snuggle up in front of your in-room fireplace at the Mary Budden Estate. Cottages with names such as Wisteria and Cherry Blossom are made for romance. 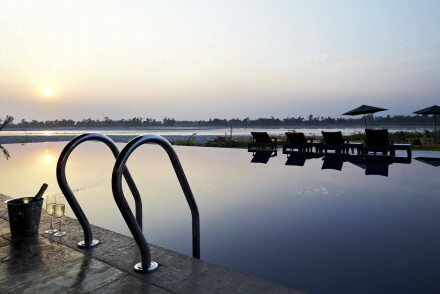 A two-day journey from Delhi, Leti 360 is the ultimate secluded spot. Luxurious rooms with floor to ceiling glass walls looking out over Heeramani glacier. Private lunches and candlelit dinners complete the package. A luxury, eco escape. 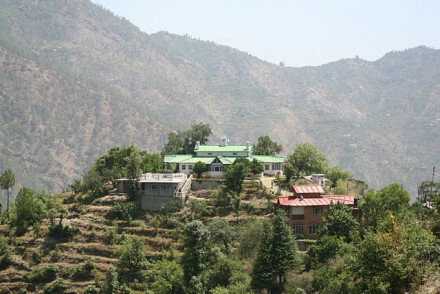 Many of Uttarakhand’s hill stations gained popularity during the time of the Raj and their colonial edifices still stand. 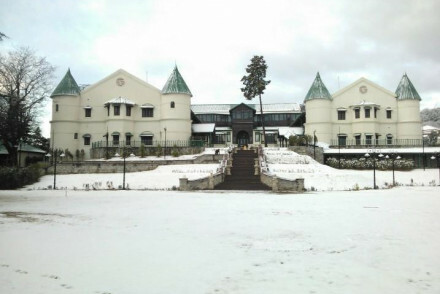 Some famous names in classic hill station locations. Whilst they might not be as grand as they used to be Fortune The Savoy and The Claridges Nabha Residence both provide a colonial stay. There are some admirable eco stays here, committed to sustainable tourism and conserving the state's wildlife and environment. Some in a most luxurious manner. You won't find any air conditioning at Jim's Jungle Retreat just an unwavering commitment to sustainable tourism. 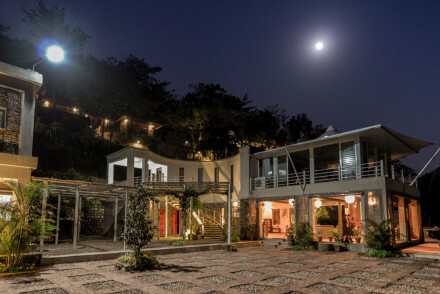 Using recycled rainwater, solar power, home grown organic vegetables as well as being pioneers of the Mahavan Project. The perfect stay for the eco warrior. Whether generation old family properties or colonial bungalows turned heritage hotels, Uttarakhand boasts some delightful boutique stays. Beamed ceilings, exposed brick and comfy quilted bedspreads - Rokeby Manor is a quaint hideaway brought into the 21st century by an outdoor hot tub with a view and excellent spa treatments. 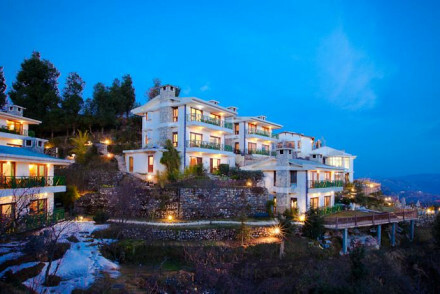 One of our favourite properties by Neemrana, and in Uttarakhand for that matter: Glasshouse on The Ganges offers style, perfection and a quiet stay. Each individually decorated room is a boutique lovers dream. Colourful rooms and delightful eccentricities Fredy’s Bungalow is a cosy stay surrounded by woodland yet close to Nainital town. A great option at a great price. 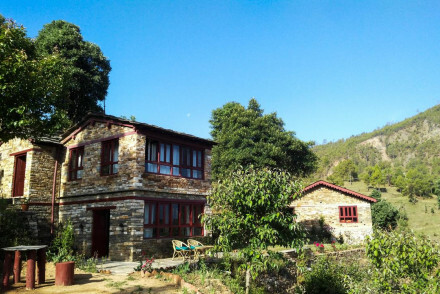 Some people shy away from the ‘homestay’ but in Uttrakhand there are some excellent options – where you will feel at home as soon as soon as you arrive. Shaheen Bagh boasts what is widely considered as one of the best private gardens in the country and all rooms are decorated with love. 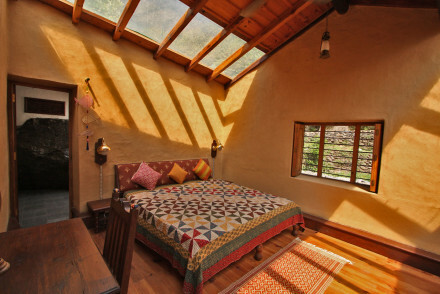 Similarly The Cottage has had owner Bhuvan’s heart and soul poured into it. Quaint, comfortable rooms and home-cooked meals complete the stay. Paddy’s cooking and unbridled hospitality will simply blow you away. The Retreat does what it says on the tin and is a perfect mountain escape. You will want to go back! 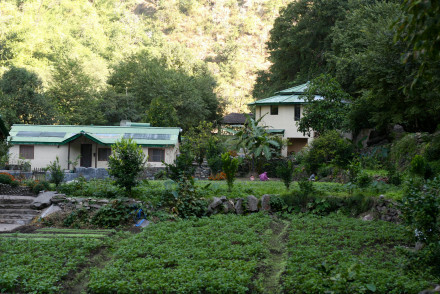 More than just your average homestay Dalar Village Homestay combines luxury accommodation with an authentic homestay experience. The best of both worlds. You don't get more authentic than Haveli Hari Ganga. Located in the holy HIndu city of Haridwar it includes charming haveli accomodation, yoga and meditation, and a full vegetarian menu. The mountains are calling you, for some ultimate downtime. Uttrakhand has some great relaxing breaks, many with the added bonus of limited phone connectivity! 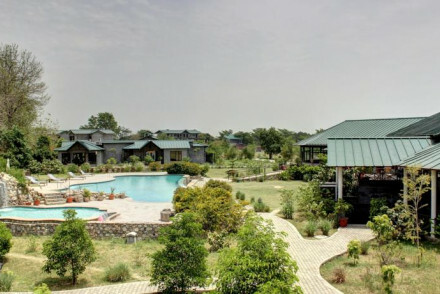 Set amidst verdant gardens, pools and waterfalls Corbett Hideaway is ideally located for discovering the nearby wildlife. A peaceful (the clue is in the name) abode. 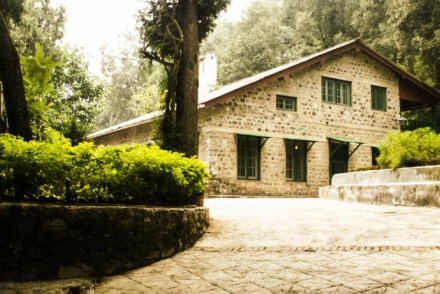 Similarly Mohan’s Binsar Retreat may be situated in mountain country but guests come here to relax and recuperate in front of their private log burner. Soulitude in the Himalayas and Soulitude by the Riverside both provide chic accommodation and are the perfect destinations for a little bit of solitude. Fly to either Delhi, Bangalore or Mumbai and get a direct flight to the Jolly Grant Airport, 22km from the city centre. Go between March and June, before the monsoon season, when there is little rainfall and the temperature ranges between 20 and 35 degrees. Far from the chaos & crowds, in the gorgeous Kumoan belt, sit 6 charming colonial cottages dating back to 1830. The rooms offered in each building vary but all are cosy & traditional & full of character. Surrounded by orchards, on the edge of a cliff with wonderful views, this is a magical hideaway. 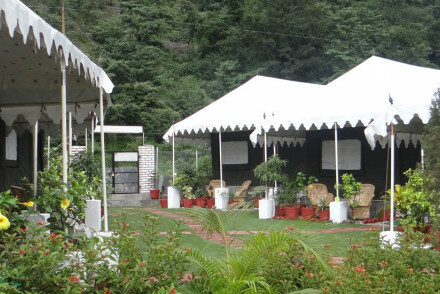 AquaForest provides comfortable accommodation on the banks of the Ganges in six air conditioned tents. More than just a place to rest your head, staff will go out of their way to organise your trip in Rishikesh. Breakfast and dinner are served and included in the price. Book or you'll miss out! Back to Nature - Located on the banks of the River Ganges you sleeping as close to nature as one could be. Local markets - Laxman Jula market is great for picking up clothing, jewellery and naturally made goods. Sights nearby - The evening 'aarti' is a must visit when in Rishikesh. Retreat to this charming 19th century colonial bungalow, which has been in the Smetacek family for decades. Owner Paddy knows the way to any guest's heart: through their stomach. The food is sublime. Rooms have barely changed since the 1950s and are filled with antiques. Leave the city life behind. Back to Nature - Ensconced in the Kumaon region's tranquil nature, sonorous birdsong and ubiquitous lakes. Great walks - Traverse the Lakeland Estate, a former British tea plantation. Kayaking - On nearby Bhimtal Lake you can hire kayaks and pedalos. Birdwatching - The Kumaon region is famed for its colourful birdlife. A hidden gem, a rural idyll: call it what you will this property is unique. A hairpin bend off the Nainital road, once in The Cottage's verdant embrace you will forget the outside world. Large rooms with views are awash with antiques and vibrant prints. Meals are delicious Indian home-cooking. Local markets - Amongst the bric-a-brac, shops like Pahari sell fair trade fabrics, candles and toiletries. Hideaway - A sharp hairpin bend off the main road you feel a million miles away from civilisation. Great walks - There are plenty of excellent valley walks directly from the property. Sights nearby - Nainital, with its temples and mosques is just a short drive away. Idyllic, intimate getaway location in the Himalayas. Warm, friendly, personalised service. Wood-panelled, inviting rooms with awe-inspiring views onto the stunning mountains. Authentic dining in the restaurant which looks out onto the carefully landscaped garden patio. Balconies and outdoor terrace. Views - Stunning views of the snow-topped Himalayan mountains. Great walks - Staff at the hotel will be happy to advise on great hiking paths in the vicinity. Sights nearby - Located near the historic Kasaar Devi temple. Contemporary yet no less authentic wilderness retreat (the lack of internet access take care of that). Smart rooms with mod cons enjoy jungle views. There is a large outdoor pool and restaurant serving regional cuisine. A comfortable stay in an off the beaten track location. This modern manor house has fragrant landscaped gardens and much entertainment. Rooms are large and feature exposed wood floors and ornate upholstering. Some have private terraces. Cuisine is European and Asian and there are plenty of al-fresco dining areas plus the inviting Courtyard Bar. Sights nearby - The neighbouring lake towns of Bhimtal and Sattal are quiter than Nainital and worth a visit. Great walks - The hotel organises guided walks including an al-fresco picnic. 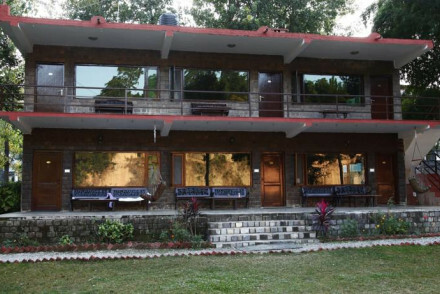 Comfortable, chic, contemporary accommodation on the outskirts of Corbett National Park. Great for families there are plenty of on site activities and a large outdoor pool - even the dog is welcome! Multinational cuisine is served plus there is a relaxing spa. Everything you'd want! 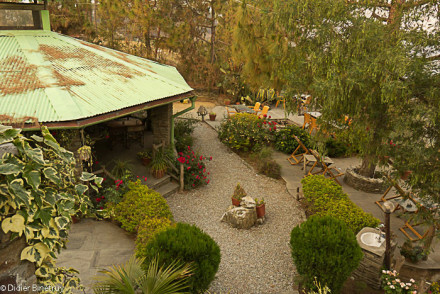 Relax in 22 acres of riverside calm, in the foothills of the famous Himalayas. The exterior mimics a English village and the rooms showcase high ceilings that mirror the great outdoors. Between the pool, the riverside sun deck and the pagoda you can feast on multi cuisines. A fantastic spot. Great walks - To the temples, waterfalls and along the Kosi River. Remote - On the outskirts of Jim Corbett National Park. Fishing - Take a ready-made picnic from the resort. Views - Rooms are either garden or river facing. 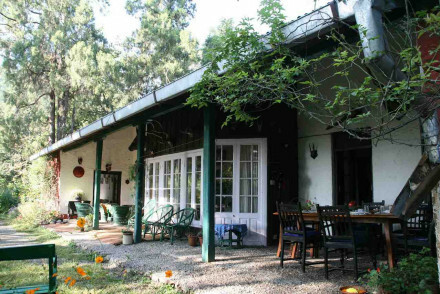 Cosy, colonial stone bungalow located in a secluded setting surrounded by hills and lakes. Interiors feature curiosities such taxidermy butterflies, hunting trophies and plenty of books on the local wildlife. Bedrooms are colourful and comfortable. No internet means it is a complete escape. Local markets - Pop into Nainital town - and make sure to visit Sakley's Cafe when you do! 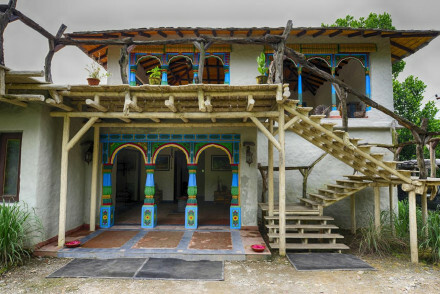 A charming hillside property consisting of three guest cottages built in traditional Kumaoni style. Interiors are simple and appealing with exposed stone, wooden floors and bursts of colour coming from the soft furnishings. The views are of course spectacular. Mountain chic. This iconic home-stay owes its success to the sheer love that everything is done with: from the meals, to the decor, to the service. A colonial style bungalow the interiors hark back to the days of the Raj with intricate four posters and ceramics. There's an outdoor pool and stunning gardens. Garden - Considered one of the best private gardens in India, and filled with many rare trees and plants. Great walks - Get on your walking shoes and explore Dehradun's scenic countryside. Birdwatching - A popular spot for birdwatching with a wide range of species. Fantastic location in the pilgrimage city of Haridwar, located directly on the Ganges with private bathing access. Charming and spacious interiors with detailed arabesques and carved-wood furniture. Rooftop terrace offers incredible views over the river. Spa, massages, yoga and esoteric activities. 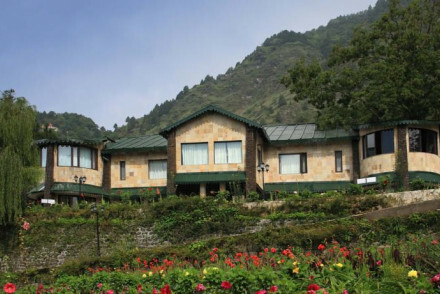 Romantic hill station hideaway, ideal for couples. Colonial bungalow turned boutique hotel rooms are filled with the antiques from the owner's personal collection. Continental and regional dishes are served at The Oaks restaurant whilst Cafe Flashback dishes up comfort food. The perfect retreat. A design property and a perfect blend of active and pamper break. Boasting a spa with floor to ceiling windows and a bounty of excursions, there is something to suit every tempo. 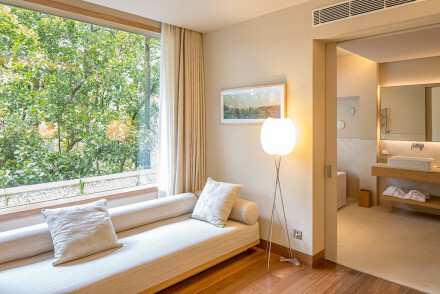 Rooms benefit from private balconies and are decorated in locally sourced woods and rich colours, with modern bathrooms. 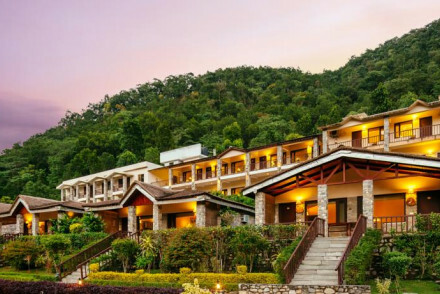 Nestled on the banks of the Ramganga River surrounded by mountains and forests, this spa resort offers a well-heeled, tranquil, and rural haven. Find modern and light colour-schemed rooms, two restaurants and many nature-based activities. It's got it all: luxury, wildlife, adventure and style. Views - Over the Ramganga River surrounded by mountains and thick forest. Birdwatching - In the 5 acres of nature there is a lot to see. Back to Nature - Surrounded by nature and gardens. 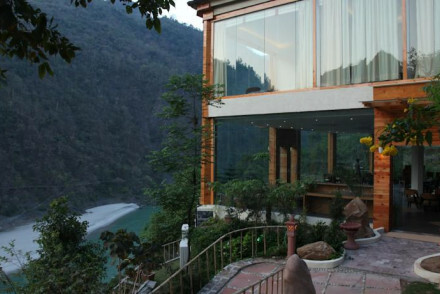 This quaint property, built from local traditional stone, enjoys stunning views across Nainital Lake. It features four dining options and an atmospheric bar. Rooms are clad in pine and have an antique, colonial feel including classic fabrics. A homely stay with a plethora of outdoor activities. Great walks - Climb up the quantly named 'tiffin top' for views of the town. Sights nearby - Satal and Bhimtal are within easy reach and worth a visit. Fishing - The hotel can help organise morning fishing trips. Sailing - Take a boat out on Nainital Lake. This charming hilltop hotel offers accommodation with stunning mountain views and a calm, quiet garden. The restaurant serves classic Indian curries and continental cuisine - enjoy meals on the peaceful outdoor deck. Bedrooms have an English heritage feel with hard wood floors and large windows. With 180° Himalayan views and plenty of pine panelling there is something 'ski-lodge' about Soulitude - especially under a blanket of snow! Rooms include wood burners, living areas, stunning vistas and are decorated in pop colours. There is a small a la carte menu. 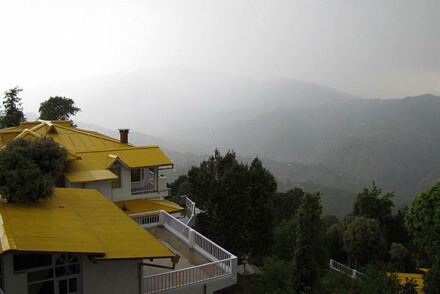 A relaxing hill station retreat. 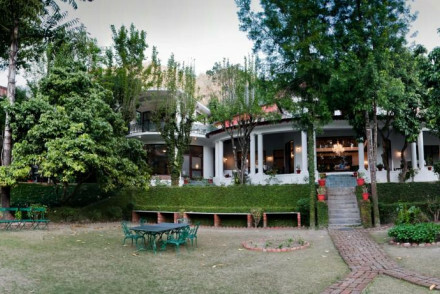 Sights nearby - Sakley's Mountain Cafe in Nainital is a must visit. Indulge your sweet tooth! A simply charming and very zen mountain escape. The architecture applauds the surrounding beauty with large windows whilst rooms embrace traditional decors. Bathrooms feature natural woods and stone. Meals are served in the Dhaba restaurant and many of the ingredients come from the property's farm. Back to Nature - The sound of bird call and the gushing river fills the air. Verdant forest surrounds you. Part of the Claridges hotel chain providing old school service (a little rusty at times!) and colonial interiors. Great for families, there are plenty of on site facilities such as tennis, basketball plus a gym and spa. The Pavilion restaurant and Victorian Bar serve up Asian and Western dishes. Luxurious, spacious rooms are set amidst gardens, a pool and waterfalls. Four restaurants to choose from. 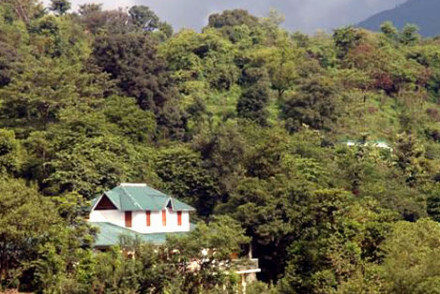 Close to Jim Corbett National Park a range of nature filled activities are at your fingertips. Whether it is the great outdoors or a relaxed break, The Corbett Hideaway is the perfect place. Back to Nature - On the outskirts of Jim Corbett Tiger Reserve. Hideaway - In the name! 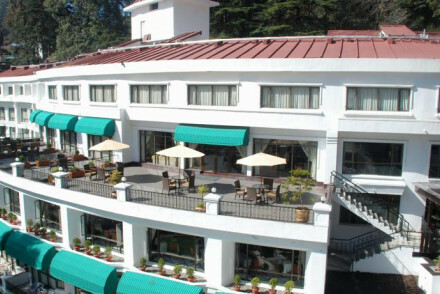 An inviting and refined hotel with views over the Naini valley. 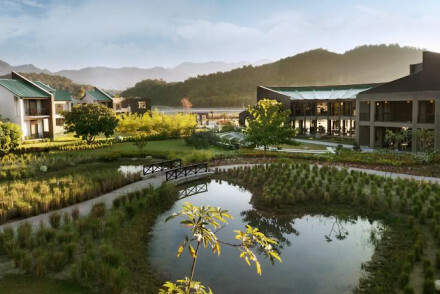 Steeped in nature yet with all modern conveniences, the hotel features a spa, gym, kids' area and three dining options. Rooms are well-appointed and tasteful, while suites offer a taste of more opulent living. 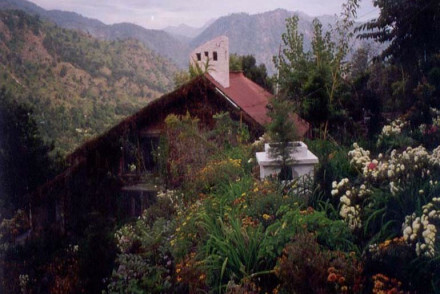 Wellness retreat hidden away in the Kumaoni Hills. Ten unique cottages allow ultimate privacy and mountain views. The emphasis is on wellbeing with a personalised vegetarian menu and wellness programme courtesy of the in house Ayurvedic specialist. Yoga and meditation also available. 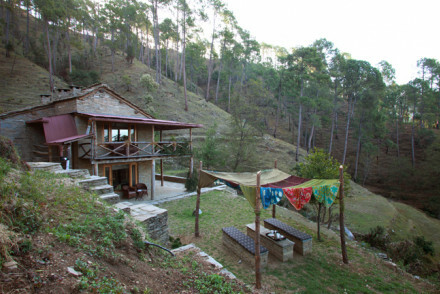 Unwind..
Great walks - Through the rice terraces, Kumaoni villages and cedar forests. Utterly picturesque. Birdwatching - Along with documentaries for the true bird lovers. Back to Nature - Immerse yourself in nature. 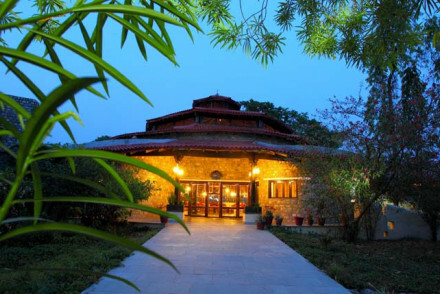 This spa and fitness resort in the heart of Jim Corbett goes above and beyond for business facilities. Bedrooms are modern, light and spacious. 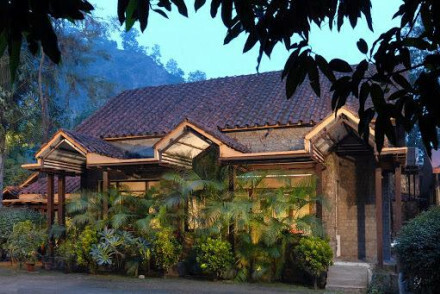 The multi-cuisine restaurant is highly recommended, as are the activities and the proximity to the famous national park. Come to combine work with pleasure. Great walks - Walk along the Kosi River or to the multiple temples dotted around the region. Birdwatching - A wide range to be seen by the keen bird watcher. Back to Nature - Nature all around. 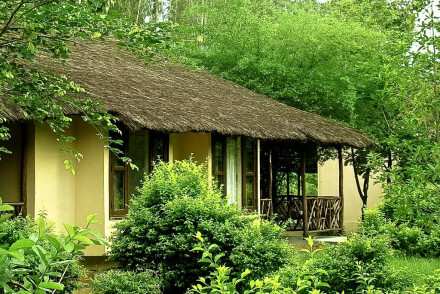 Corbett National Park's top luxury eco escape. From solar energy and recycled water to organic veggies and their Mahavan Project, Jim's Jungle Retreat is committed to sustainable tourism. Private cottages feature four posters and private terraces. There is a pool, spa and delicious al fresco dining. 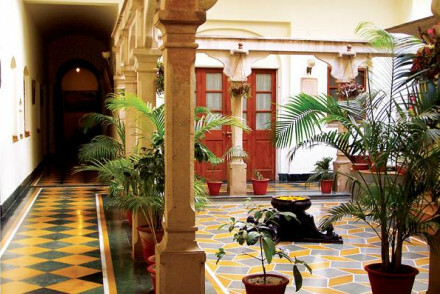 Another of Neemrana's faultless heritage hotels. With an enviable location on the banks of the River Ganges, nestled amid a mango orchard, Glasshouse boasts vintage decor and friendly service. Rooms are bespoke design, making the most of the views and filled with antiques. For true escapists! Back to Nature - Lying on the banks of the River Ganges this property reminds guests of the simpler things in life. Sights nearby - Visit The Beatles' ashram, as it has now become known, where the group stayed in the 60's. Local markets - Rishikesh market is a great place to pick up some trinkets to take home. Birdwatching - There is an impressive variety of nesting birds along the river banks. A unique retreat to experience secluded mountain living. Room design inspired by the flora of the mountains, with harmoniously coordinated furnishings and whitewashed stone walls. Peaceful and homely shared and private spaces create a sense of community and tranquillity. Great walks - Jilling Terraces organises its own hiking trail itinieraries which are guided by local conservationists and experts. Built in 1902 this Gothic style property is a grandiose structure. Rooms are decorated in a classic style with pastel blues and yellows. There are vast lawns where guests can enjoy a game of badminton or cricket. A breakfast spread is included in the price whilst meals are served at Fortune Deli. Rokeby Manor is a charming Himalayan hotel retreat with a quiet spa and outdoor hot tub. The hotel offers guests a number of suites and cosy bedrooms, including a three bedroom cottage. The restaurant has a homely feel and serves Indian and continental dishes. Enjoy peaceful evenings by the bonfire. Sprawling luxury hotel on the banks of the Ganges. Spa, sauna, infinity pool, meditation, yoga and massage for those who want to relax. Adventure sports and exploration for active holidaymakers. Private villas, family suites and tastefully furnished bedrooms. Onsite restaurant. Views - Onto the Ganges and the surrounding forested mountain slopes. Kids Club - Kids club and playground for children. Where leisure, activities and serenity meet. 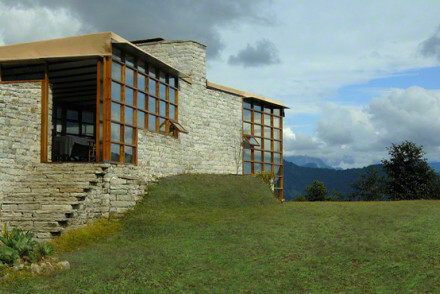 Chic, modern mountain hideaway ideal for families and outdoor lovers. 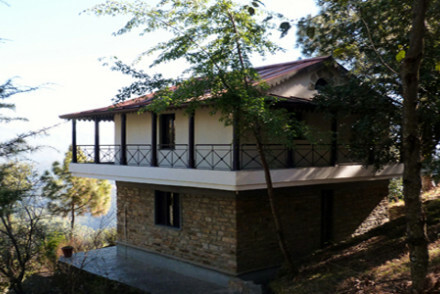 Comprised of 22 private cottages with iPod docks but no TVs, private terraces and Ganga views. Comfort food is served in the cosy White Water Cafe. An award winning hotel. 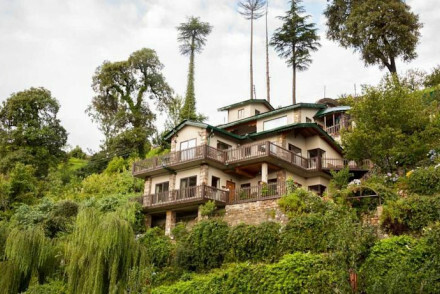 Located along the banks of the Kalsa River, within easy reach of Nainital, this property offers rustic luxury accommodation in the Himalayan foothills. Seven bedrooms decorated with traditional accents are dotted around a working organic farm, amidst waterfalls and flowing streams. A true escape. 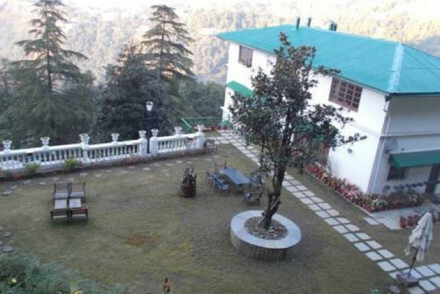 Located 90 minutes from Mussoorie this property is prime hill station territory. Boasting contemporary rooms with exposed brick walls, fire places and private terraces benefitting from mountain views. Surrounded by flowery gardens there is a small spa, kids activities and multi-national dishes. 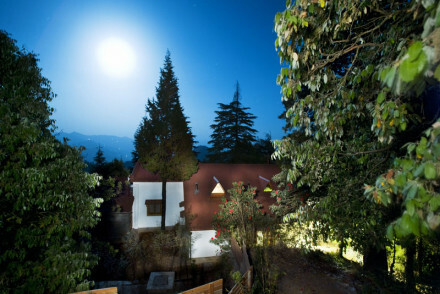 A luxury retreat in the heart of the Indian Himalayas. Spacious modern bedrooms, a large entertainment centre with expansive spa and fitness suite. Offers guests an elegant restaurant and conference space with stunning mountain views. A beautiful spot with plenty of activities for all the family. 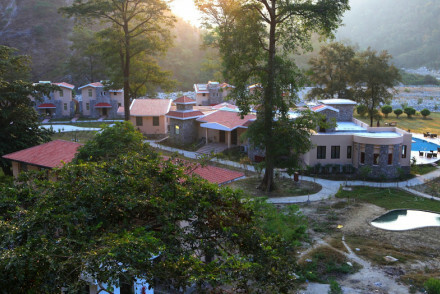 Individual luxury cottages nestled in the nature of Corbett National Park. Rustic chic interiors have a traditional feel yet luxuries are not amiss with the best rooms offering private plunge pools and copper roll-top baths. Expert naturalists are on-site and there's delectable cuisine to return to. Two bedroom village house with charming vintage interiors. Plenty of exposed brick, thick rugs, colourful cushions, roaring fires and luxurious bathrooms make this an inviting stay. Meals are cooked with vegetables cooked from the kitchen garden and staff are effortlessly friendly and helpful. Utterly charming 19th century homestay. This family run affair offers you as warm a welcome as the crackling fire does in your room. Cosy cottages provide guests with mountain views, sitting rooms, antique furnishings and total seclusion. Delicious meals and cooking classes are available. Former palace turned luxury spa retreat. Rooms are decorated in natural palettes of creams and greens, all have balconies. The restaurant serves healthy cuisine and there is daily afternoon tea with sugar-free options. There is a pool, award winning Ayurvedic spa and fitness centre. Spa breaks - One the most renowned spas and arguably the best in the world for Ayurvedic treatments. Local markets - The town of Rishikesh is awash with shops and stalls selling local handicrafts and religious artefacts. Sights nearby - For music fans The Beatles ashram is worth a visit. To call Vana a spa or retreat does not cover it; it is a philosophy. Combining ancient Indian and Tibetan traditions be transported into a realm of peace and tranquility. Rooms have natural decor and colour palettes and include private balconies. Cuisine is health conscious. Minimum seven nights. Restrictions on children - Guests must be aged 16 years and above. Great walks - Around the estate's sprawling grounds. Simply stunning, award winning wilderness retreat. Architects have combined locally sourced stone and timbers to create a modern design whilst traditional textiles and furnishings induce chic interiors. Staff are tirelessly helpful and food is delicious. There is a three night minimum stay.